Dermaplaning creates a healthier, more radiant appearance. A Dermaplaning facial or treatment is a highly effective method of manual exfoliation. Dermaplaning gently removes the outermost layers of dead skin cells and “peach fuzz” (vellus hairs) with a custom dermaplaning blade and leaves your skin feeling baby soft, smoother and brighter. How is a Dermaplaning facial done? An instrument resembling a surgery scalpel is used to gently scrape away the outermost layer of dead skin. That can be followed with an application of an AHA/BHA solution to maximize exfoliation. We use SkinCeuticals peel products. Dermaplaning makes your skin softer and smoother immediately. 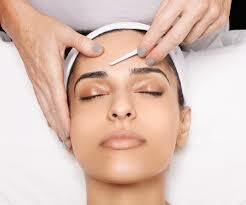 We are also able to combine dermaplaning facials with a chemical peel to maximize the efficacy of the peel. The peel is better able to deeply penetrate the skin after a dermaplaning treatment because the surface debris has been completely removed. Yes, dermaplaning is very safe when performed by a highly-trained aesthetician. It is recommended for the face only. Microdermabrasion and dermaplaning are both methods of manual physical exfoliation by different technique. Microdermabrasion sands and then suctions dead skin cells, while dermaplaning safely scrapes off the outer most layers of skin. Dermaplaning is very good for drier skin types and anyone who wants to get rid of facial hair. Hair will not grow back thicker. Both methods are good for most everyone. It is simply personal preference. Dermaplaning is one of the only options for sensitive or dry skin. This procedure will not get rid of wrinkles or sunspots, but it does remove the top epidermal layer of skin and dead skin cells, giving you a healthy glow! How long does dermaplaning last? Dermaplaning lasts 4 to 6 weeks and gives you a natural, healthy glow. We offer safety and expertise as a fully licensed medical facility.